The other day, we had the photo shoot for the Kouhaku poster! There were some off-shots in TV magazines and such. 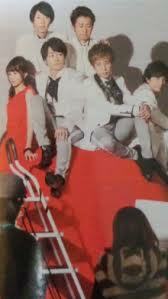 She and the Arashi members had to climb a sphere about 2m high for the shoot! !